Think Donnie will pay up now? And not just some random spot, but at Doyle's, the Herald reports. Here's the letter our senator was kept from reading on the floor of the Senate. At least treatment of Massachusetts senators has improved over the years. Sea of protesters fills Common, flows down Beacon Street and Comm. Ave.
From Beacon Street to Boylston Street, from Charles Street to well past the Frog Pond, tens of thousands of people filled Boston Common today for a protest against the new administration. From Mayor Marty Walsh and Sen. Elizabeth Warren to women, men and children in the crowd, people vowed to fight for health care for all, for immigrants, for LGBT rights - and for science. Read more. Thousands showed up at Faneuil Hall for a rally to save the ACA today, as Molly Lanzarotta shows us. "When they say repeal, we say resist and reclaim," Sen. Ed Markey said. "This is no time to quit," she writes. 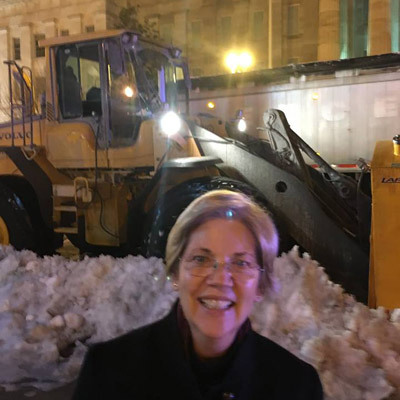 There's a huge piece of equipment here in DC clearing the snow and shooting it into 18-wheelers to be hauled off – and it has Massachusetts plates! I don’t know if this snow-eating monster was your doing, Marty Walsh, but thanks! Could be. Last we heard, our giant snow blowers were helping out in Baltimore. Over at Blue Mass. Group, David peruses the Globe's full-on campaign to get Warren's hat in the ring and explains why he thinks she might be better off not running. The senator was also protested by those who came to criticize her stand on the most recent chapter of the Israel-Gaza conflict. Once inside, however, Warren seemed to back away slightly from statements she made in August, saying that Palestinians had a right to self-defense. In a national drive to reduce gun violence, No More Names, a project of Mayors Against Illegal Guns, began a nationwide tour on June 14 in Newtown CT on the six-month anniversary of the mass shooting at Sandy Hook Elementary. At today's rally at Faneuil Hall in Boston, speakers included Rev. Kim Odom, whose son Steven was 13 when he was shot and killed in Dorchester in 2007, Mayor Tom Menino and Senator Elizabeth Warren. Scott Brown campaigned as a moderate independent but if you look at his record, he's a Republican who voted with Republicans 90% of the time in the US Senate until Elizabeth Warren announced her candidacy, and then he voted with Republicans on votes of importance 76% of the time. No matter why you think he lost, you must consider whether the second most bi-partisan senator was still too conservative for Massachusetts. You can call her Senator Warren now. As more votes come in, WHDH is calling Elizabeth Warren the winner over incumbent Scott Brown. Among other things, Warren becomes the state's first woman senator. Salon took a stopwatch to the debate tape and found that Scott Brown spoke 23 minutes and 40 seconds to Elizabeth Warren's 18 minutes and 15 seconds. Both Andy Hiller of WHDH and the Morning Joe crew noted how Scott Brown is tiptoeing right up to bullying Warren. Character judgments aside, he is blowing a big hole in his 'Nice Guy' bona fides. Jump in with your thoughts.